Service (APHIS) has confirmed the presence of highly pathogenic (HPAI) H5N8 avian influenzain a commercial turkey flock in Stanislaus County, California. Avian influenza — commonly called “bird flu” — is a disease found in a wide variety of domesticated and wild birds. Once introduced into an area, infection can spread through bird-to-bird contact or through contact with contaminated clothing, shoes, hands, feed, water or equipment. Because waterfowl are reservoirs for avian influenza strains that can be fatal to domestic poultry (yet often show little to no signs in waterfowl), backyard and commercial chickens raised near areas commonly used by migrating waterfowl are at risk of transmission. “Due to normal waterfowl migration along the Pacific Flyway, during the winter there are approximately eight times the number of waterfowl in California than what we will see three months from now,” said Maurice Pitesky, a poultry specialist with the UC Davis School of Veterinary Medicine. “There are lots of birds that winter and establish roosting and feeding habitat in California wetlands and agricultural crops. If you are a poultry owner — either backyard or commercial — and live in proximity to waterfowl and their habitat, your birds are at risk.” This is the first finding of HPAI in commercial poultry during the ongoing disease incident in the Pacific Flyway. No human cases of these avian influenza viruses have been detected in the United States, Canada, or internationally, and there continues to be no public health concern. Many residents of San Joaquin County have backyard birds. 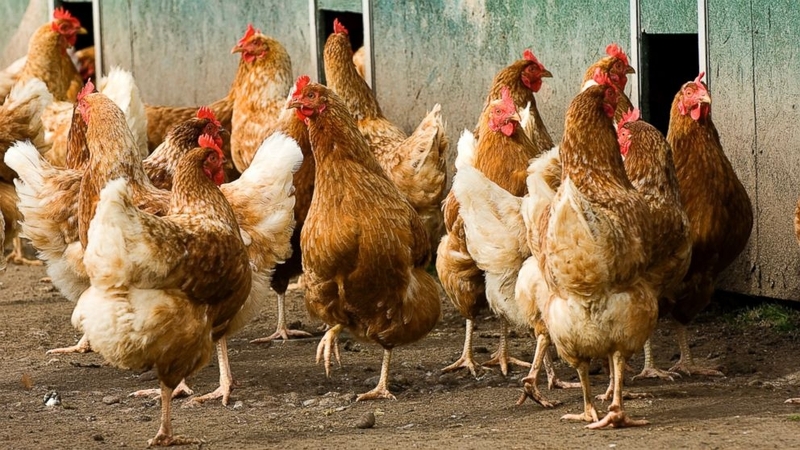 Although your typical backyard flock is not the same scale as a commercial poultry operation, it is important to keep your birds safe and healthy. If you or someone you know have backyard flocks make sure that they remain confined for the remainder of the winter and do not go onto the premises of anyone else who has birds. This is spread primarily through wild birds coming into contact with domestic. Keep Your Distance: Restrict access to your property and your birds. Consider fencing off the area where you keep your birds and make a barrier area if possible. Allow only people who take care of your birds to come into contact with them. If visitors have birds of their own, do not let them near your birds. Game birds and migratory waterfowl should not have contact with your flock because they can carry germs and diseases. Keep It Clean: Wear clean clothes, scrub your shoes with disinfectant, and wash your hands thoroughly before entering your bird a rea. Clean cages and change food and water daily. Clean and disinfect equipment that comes in contact with your birds or their droppings, including cages and tools. Remove manure before disinfecting. Properly dispose of dead birds. Don't Haul Disease Home: If you have been near other birds or bird owners, such as at a feed store, clean and disinfect car and truck tires, poultry cages, and equipment before going home. Have your birds been to a fair or exhibition? Keep them separated from the rest of your flock for at least 2 weeks after the event. New birds should be kept separate from your flock for at least 30 days. Don't Borrow Disease From Your Neighbor: Do not share lawn and garden equipment, tools, or poultry supplies with your neighbors or other bird owners. If you do bring these items home, clean and disinfect them before they reach your property. Tremors, drooping wings, circling,twisting of the head and neck, or lack of movement (END) Early detection is important to prevent the spread of disease. Report Sick Birds: Don't wait. Owners of backyard chickens who observe illness or increased mortality in their birds should call their veterinarian, local Agricultural Commissioners Office at 209-953-6000. or the California Department of Food Agriculture sick bird hotline at (866) 922-2473. All bird owners, whether commercial producers or backyard enthusiasts, should continue to practice good biosecurity, prevent contact between their birds and wild birds, and to report sick birds or unusual bird deaths to State/Federal officials, either through your state veterinarian or through USDA's toll-free number at 1-866-536-7593. Additional information on biosecurity for backyard flocks can be found at healthybirds.aphis.usda.gov. The University of CA has a great website for Backyard Poultry including basic care, coop design and disease information. Click here to watch a video full of helpful tips on keeping your backyard flock safe and healthy. If you have a gardening related question you can contact the UC Master Gardeners at 209-953-6112. More information can be found on our website.